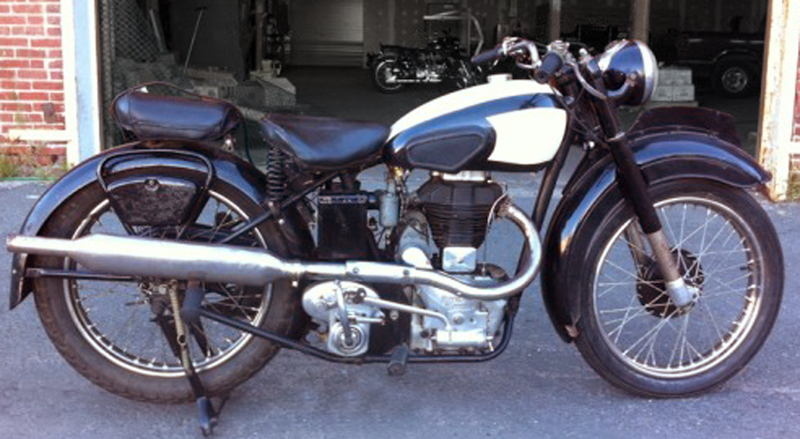 1949 Royal Enfield Model G.
A 65-year-old Royal Enfield Model G is the latest "object" commanding the attention of Peter E. Raymond. He is one of the people helping the Royal Enfield Badger project go. The Badger is a racer, made from a Bullet. Peter's Model G is something else again. 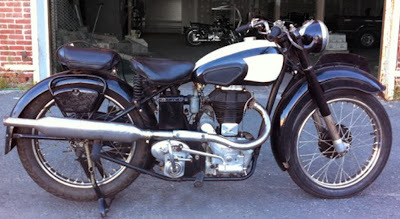 The Model G was the motorcycle Royal Enfield improved (adding the famous swing-arm rear suspension and an updated motor) to create the modern Bullet. The Model G is a hardtail, giving it a graceful, low-slung beauty and iron-hard ride. Peter calls it "a lovely little bike, with a nice honest patina. "This was a CraigsList find. I was in the airport just about to board a flight when I found it. I called Leon at Cycle Icons (the Badger's builder-in-chief) to see if he could work out a deal. "When I landed plans were set for a trip to Boston to get this gem. We are working on the forks and fitting with new cables but otherwise it is rideable as is. Leon's comment: 'It's like riding a Radio Flyer,' as the spring seat and front float all over the place." Peter has since issued this update: "Spent the day working on the forks and I properly screwed them up. I was milling down some rough spots from old welds to allow the new bushings to fit and gouged the hell out of the left fork. So I am now looking for some old springers. After giving up on that, I fitted new fuel lines and watched all the gas spill out of the petcocks. They would just spurt, so cleaned that up, removed the tank and ordering new petcocks." You can follow his progress on his blog, which, he writes, features "my work, ideas, designs, art, images and observations." Of the collection of "objects" on his blog, he says, "Some I own, some I will, and some I have lost. Most are from a time now past yet still hold a place in today's world of over valued and under delivered goods."